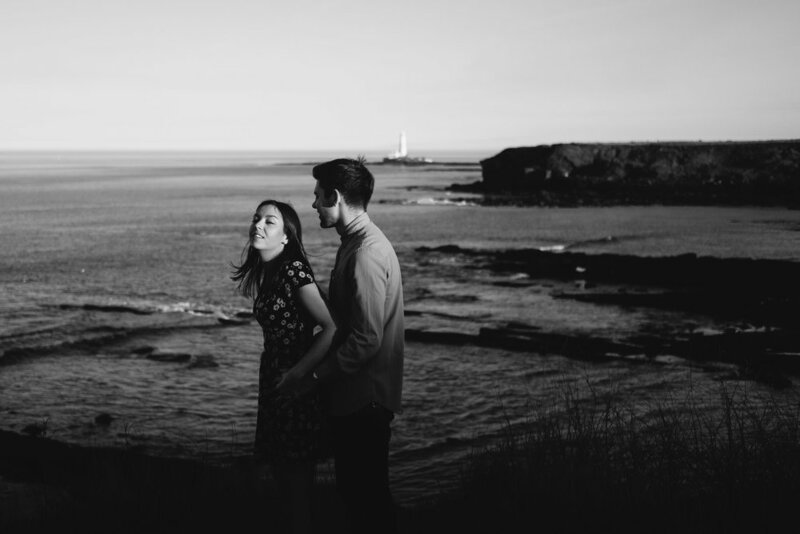 Stick a pin in a map pretty much anywhere on the Northumberland coast and you'll find an epic location to photograph an engagement session. Time it for golden hour, that time of magical light an hour before the sun sets, and you'll have something really special. Add an awesome couple up for an adventure and you have perfection. Tom proposed to Jess while they were in Iceland, in the Blue Lagoon under a ridiculously starry sky. They enjoy adventuring outdoors, spending weekends hunting for the northern lights or walking in the Lake District. The Northumberland Coast is pretty special to Jess, especially since her Dad passed away, as they spent a lot of time walking the dogs on Blyth beach. Jess knew a great spot on the cliff face near Seaton Sluice which was accessed by an old stairway and looked out to the North Sea. Neither Tom or Jess were put off by a little sand, saltwater or mud, which was just as well as I had them clambering over rocks and standing on clifftops for our sunset engagement session. Tom has a keen interest in photography which he put to use on holidays to Iceland, Mallorca and Mexico. He thought it'd be pretty cool to see how a professional photographer achieves great images whilst having a bit of fun along the way. I took the opportunity to play with some manual lenses, prisms, Brenizer method photos, and experiment with my editing technique, so it's fair to say we all had a bit of fun on our shoot. We weren't the only creatives out on the Northumberland coast that day. Check out the photo of the girl playing guitar on the clifftop drenched in the warm sun. She's got it all figured out. Where's your special place? Can you imagine you and your partner there at sunset, making photographs that sow off your love that you'll treasure forever? I can make that happen. Start the conversation here. And if that has whetted your appetite for couples sessions, or even real weddings, have a look at my Northumberland weddings page.